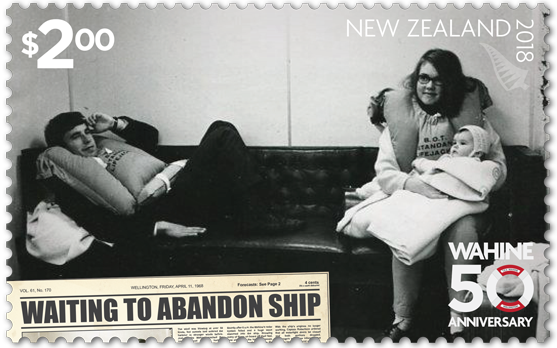 When the Wahine departed Lyttelton Harbour at 8.40pm on 9 April 1968, there were 734 passengers and crew on board. The overnight voyage to Wellington was nothing new to Captain HG Robertson: the often-turbulent Cook Strait was familiar in all its ill-behaved weather and swells. However, on this evening no-one was prepared for the raging storm that occurred when Cyclone Giselle swept down the coast, colliding with a southerly front. 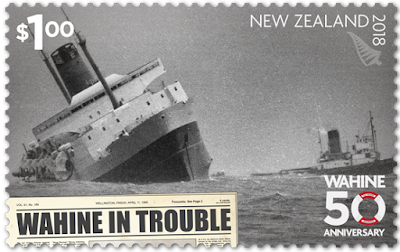 The result was one of the worst recorded storms in New Zealand’s maritime history. 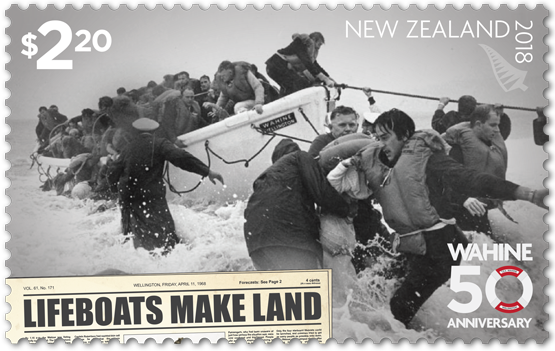 In the early hours of the morning on 10 April 1968, Wellington Harbour was encroaching on the near horizon. With the wind blowing at 50 knots, a common stiff breeze in Wellington terms, Captain Robertson made the decision to enter the narrow entrance to the harbour. On entering, the wind suddenly picked up and dramatically increased to a powerful 100 knots. Huge waves slammed the ship, forcing it towards Barrett Reef. With the radar system having failed, the Captain attempted to manoeuvre the ship back out to sea. The storm continued to wreak havoc, dragging the ship along the reef, causing further damage, and preventing rescuers from approaching it. Its ferocity also delayed the captain’s decision to abandon ship, as he believed that people would be safer on board. The first survivors began washing up on Seatoun foreshore, and others were plucked out of the water by boats waiting nearby. Most of those tossed into the waves were swept to Eastbourne’s rocky foreshore, where slips prevented rescuers reaching them quickly, and many suffered from being exposed to the harsh, deteriorating conditions. Many would ask how such a tragedy could occur right on the doorstep of the nation's capital. But it did and while the storm raged, many of the people in Wellington at the time went to watch the foundering of the Wahine unfold. News reports quickly spread across the country making this one of the most documented tragedies of our time. 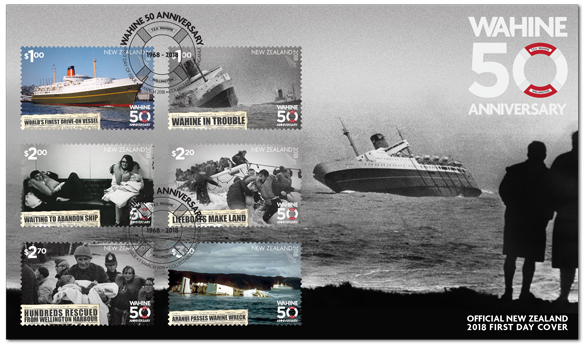 These stamps show the Wahine in all her glory and the sequence of how the day played out. 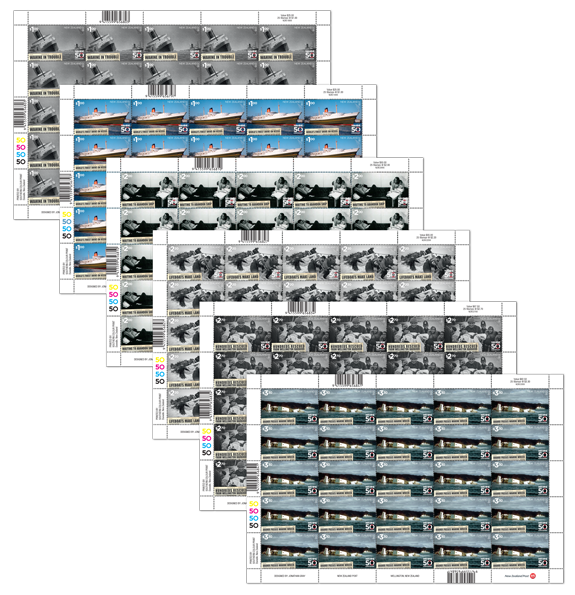 The newspaper headings on each stamp are fictitious but acknowledge the role media played in telling the story. The Wahine as photographed by Warwick Pryce during a berthing manoeuvre in Wellington Harbour. 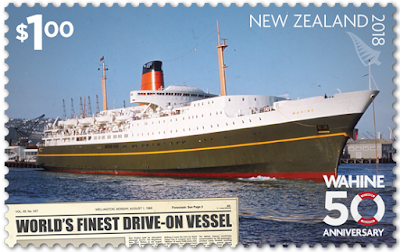 Described by the Union Steamship Company as the world’s finest drive-on passenger vessel, the Wahine could carry around 1,000 passengers and 200 cars, servicing the Wellington to Lyttelton route for 20 months before she foundered. $1.00 - Wahine in Trouble. When the full force of Cyclone Giselle struck Wellington early in the morning of 10 April the Wahine was on the final leg of the journey from Lyttelton to Wellington. As the ship reached the entrance to Wellington Harbour she lost control and was soon forced onto Barrett Reef, taking on water through a large hole below the waterline. Copied from our Post - 2008 Weather Extremes. $1.00 - Storm / January 2001 - Evans Bay, Wellington. 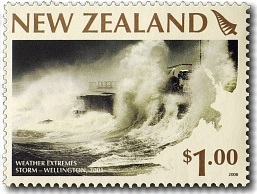 The one dollar stamp shows waves from a tropical cyclone storm surge at Evan's Bay, Wellington in 2001. The worst storms develop when the remnants of tropical cyclones approaching from the north re-intensify as they collide with strong cold fronts approaching from the south. Famous examples include 1988’s Cyclone Bola, which flooded Gisborne, 1968’s Cyclone Giselle, which sank the inter-island ferry the Wahine, and a 1936 storm that caused extensive flooding and wind damage, with buildings collapsing, trains blown off their tracks and bridges washed away. The 'Wahine' storm in 1968 was one such example. Early on the 10th of April, two violent storms merged over Wellington, creating a single extratropical cyclone storm. The winds in Wellington were the strongest ever recorded - at one point they reached a speed of 275 kilometres per hour ripping the roofs off 98 houses in one suburb and blowing three ambulances and a truck onto their sides as they tried to go into the area to bring out injured people. The storm resulted in the capsize and sinking of the 'Wahine' - an 8,944 gross tonnage drive-on passenger ship in Wellington harbour. 53 of the 734 passengers and crew on board died. $2.00 - Waiting to Abandon Ship. Sharon Major and daughter Sarah with husband Murray, waiting to evacuate from the Wahine. More than six hours elapsed between the first striking of Barrett Reef and the eventual order to abandon ship, with passengers holding onto hope the Wahine would remain floating. They would be given the order to evacuate early afternoon when the starboard list became too much. $2.20 - Lifeboats Make Land. 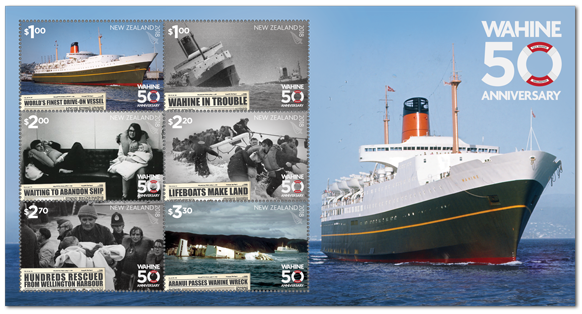 As the Wahine listed heavily to starboard the lifeboats on the port side of the vessel became inoperable, leaving just four starboard lifeboats able to be launched. The first of these would be swamped soon after entering the harbour waters, the remaining three overcrowded boats reaching the shore at Seatoun and Eastbourne. 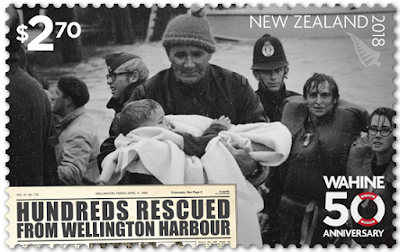 $2.70 - Hundreds Rescued from Wellington Harbour. As the light improved and the weather cleared the predicament of the Wahine reached rescuers in Wellington, with many vessels racing to the scene to pluck survivors from the harbour. Others reached the rocky coast of Eastbourne by themselves or were carried onto Seatoun foreshore. Here, policeman, Ray Ruane holds a young survivor by the jetty, surrounded by other police and members of the public. 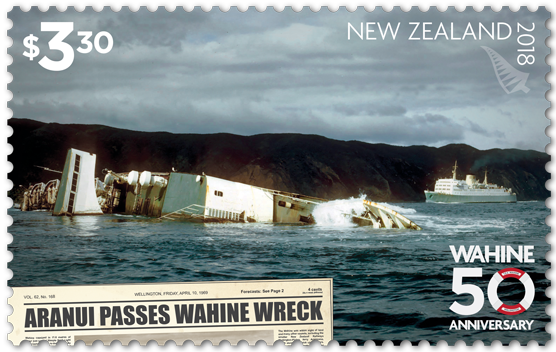 $3.30 - Aranui Passes Wahine Wreck. The Wahine would roll over to starboard for the last time mid-afternoon, and lay on the sea floor in thirty-eight feet of water. Salvage operations were underway within two weeks, but the magnitude of the damage made a full recovery impossible, and plans were made to tow the wreck into Cook Strait. Before that could happen a second powerful storm in 1969 would break the hull up, and further salvage took place where she lay. 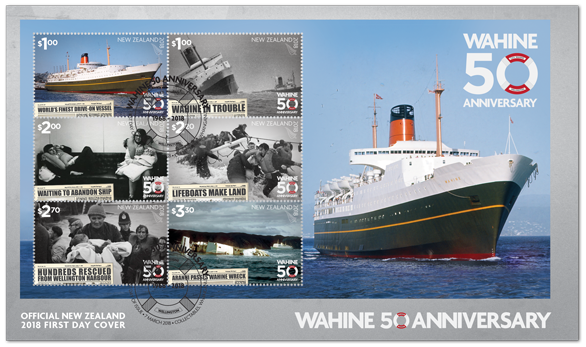 The miniature sheet features a photo of the Wahine in all her shining glory as she prepared for the voyage. Set against the grey textured background of the miniature sheet first-day cover, it’s easy to see why the vessel was a popular choice for travellers. The first-day cover gives a glimpse of the fateful day that the Wahine went down. Survivors look on from the safety of the beach as the ship slowly sinks. First Day Cover - 7th March 2918. Set of Plate Blacks. Set of Value Blacks. 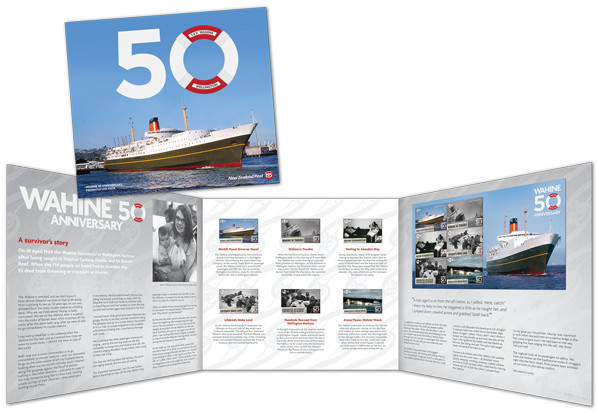 A personal story of the tragic events leading up to the sinking of the Wahine is told by Sharon Major – a passenger and survivor – in this collectable presentation pack. 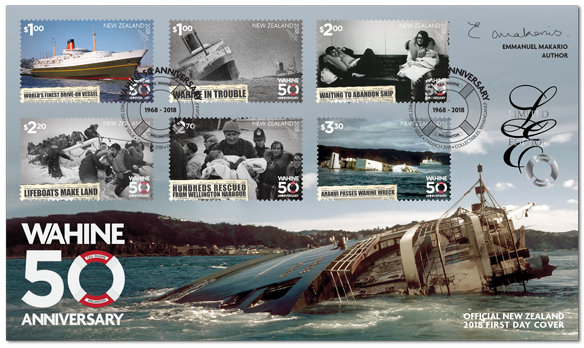 The pack contains a set of stamps, a miniature sheet and a first-day cover, as well as extra imagery and details of the sorrowful event. 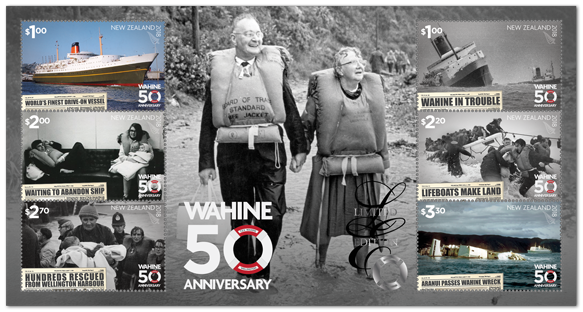 Wahine 50 Anniversary Limited Edition. 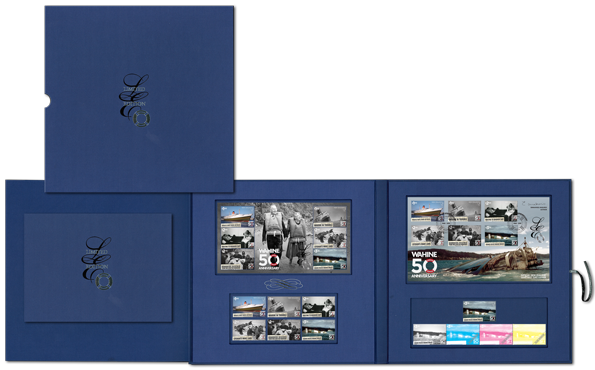 The limited edition is the ultimate collector's item for this issue. See the full set of stamps in even more depth and detail and read more about the event with copy from Emmanuel Makarios - a maritime historian. 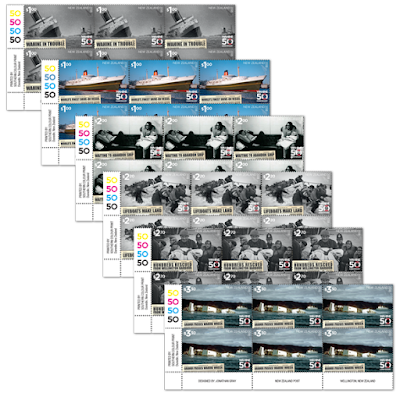 There is a special numbered, perforated miniature sheet unique to the pack and a limited edition first day cover signed by Emmanuel. This is an anazing story about an event 50 years ago. 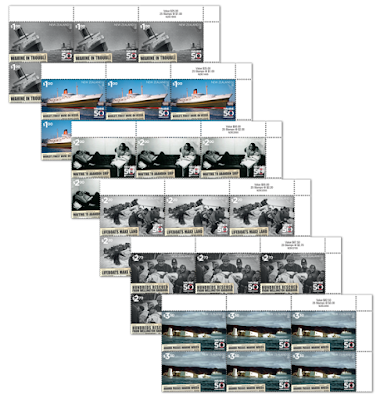 The stamps and other NZ Post items are good but I like the way you guys put this pages together and make them interesting. It found this post in a goggle search. I was on the Wahine that day with my parents and sisters. I was 15 at the time. In the confusion we became separated from each other. I was holding my young sister until a small boat found us. We ended up on the east side opposite where my parents and old sister landed. It was a terrible time as we thought we had lost them and they thought the same about us. Thankfully we all made it.